Galaxy S6 Edge Plus: How to install the SIM or USIM card? Note : Insert the SIM or USIM card provided by the mobile telephone service provider. • Only Nano-SIM cards work with the device. • Some LTE services may not be available depending on the service provider.For more information about service availability, contact your service provider. 1 Insert the ejection pin into the hole on the SIM card tray to loosen the tray. Note : Ensure that the ejection pin is perpendicular to the hole. Otherwise, the device may be damaged. 2 Pull out the SIM card tray gently from the SIM card tray slot. 3 Single SIM models: Place the SIM or USIM card on the SIM card tray with the gold coloured contacts facing downwards. Note : Use caution not to lose or let others use the SIM or USIM card. Samsung is not responsible for any damages or inconveniences caused by lost or stolen cards. 4 Insert the SIM card tray back into the SIM card tray slot. 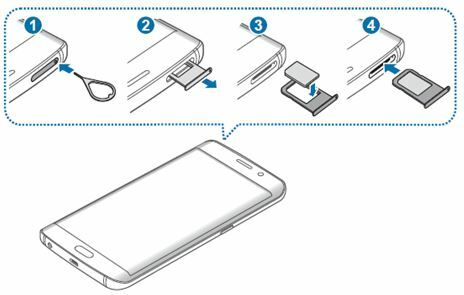 Galaxy S6 Edge Plus: How is the parts layed out? [Galaxy S6 EDGE+] Why the device does not respond when I touch the edge of the screen?